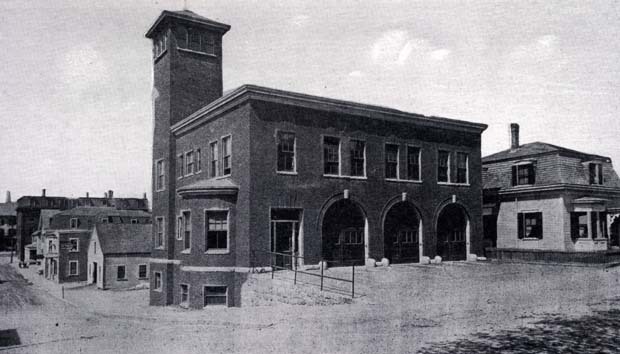 "Wakefield's brick Central Fire Station at the corner of Crescent and Mechanic (now Princess) Streets was built in 1900 after the Hathaway Stable fire destroyed the department's two-story wooden firehouse in October 1899. The department moved into its new brick joist station on December 22, 1900. Roger Howard built the new brick fire station at a cost of $17,197.58. When new, the station had a large main room on the ground floor for the three pieces of fire apparatus, three sleeping rooms, a stable with seven stalls and two chutes for the hay and grain, a hay loft, harness rooms, tool closets, washrooms, meeting rooms, and a business office which looked over Crescent Street. The hose tower was built to dry over 2500 feet of hose after they were sprayed and washed. As the department continued to grow, the number of pieces of apparatus increased as did the needs of the department. An addition was built in 1975 to accommodate the changing needs of the department. In 2001, Town Meeting voted to build a new public safety building to house both the Fire and Police Departments. Construction began in June 2002 and the fire station was razed, with the exception of the hose tower, which remained intact. The official dedication and open house of the new public safety building was held in February 2004." - Text from calendar by Jayne M. D'Donofrio. “Fire station, circa 1907,” NOBLE Digital Heritage, accessed April 20, 2019, https://digitalheritage.noblenet.org/noble/items/show/6940.